Today I'll be counting down the top ten matches of probably the greatest pure athlete ever to lace up a pair of pro wrestling boots, Kurt Freakin' Angle. Angle made easily the most successful-ever transition from the amateur/Olympic mat to the WWF/E ring, picking up the mechanics and storytelling nuances faster than possibly anyone before him. After only a few years in the business Angle became a company MVP, delivering dozens of Match of the Year candidates during his seven-year WWF/E run. He then very unexpectedly signed with TNA and repeated his in-ring success there, proving himself a cornerstone for the better part of a decade. In 2017 Angle returned "home," having expressed a desire to finish his career where it started, in WWE (also accepting a Hall of Fame induction), and in just a couple weeks he'll officially end his career at The Show of Shows. I imagine he'll transition into a full-time non-wrestling role of some kind; I for one would love to see him as a manager-type for a promising young star who needs a mouthpiece. But whatever his role, one can't deny the tremendous impact Kurt Angle has had on the business. The two best technical wrestlers in the company (and probably the world) at this time engaged in a legendary on/off feud from 2001-2003, and while not the apex of said rivalry (Hint: there's more Angle vs. Benoit on this list), this match is near the top. There was no major angle taking place between Angle and Benoit, this was just a battle for dominance. They built on their 2001 match series and delivered a blistering 15-minute clinic with nary a low point. Benoit eventually won with a quick rollup, and these two would go on to become reluctant tag partners in the quest for the new WWE Tag Team Titles. This long-awaited first-time match between WWE's top two legitimate mat grapplers took place as the main event of WrestleMania XIX; a pure athletic contest between two of the most accomplished wrestlers in the company's history. The match was a masterpiece of takedowns, suplexes and submission holds, but it is most remembered for one moment. After twenty minutes of virtuosic wrestling, Brock attempted a Shooting Star Press, a move never before executed on WWE TV by a man of his size. While he'd had no trouble performing the maneuver in Developmental, on this occasion he hesitated momentarily, preventing him from achieving the necessary rotation. Lesnar landed on his head which by all rights should have ended his career, or worse. Miraculously he only suffered a concussion and was able to finish the match, winning his second WWE Championship. Despite the botched high spot, this match remains one of the greatest 'Mania main events in the show's thirty-year history. What an amazing cage match. 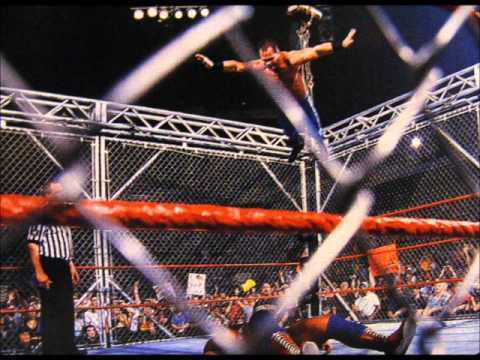 I daresay this is the greatest traditional Steel Cage bout in wrestling history. Angle and Benoit beat the bejeezus out of each other and took some mindblowingly insane high risks. 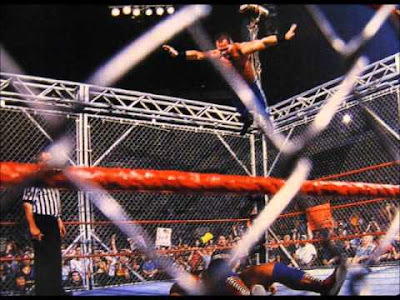 The match featured TWO leaps off the top of the cage; Angle missed a moonsault while Benoit nailed a flying headbutt. In hindsight this match probably did irreparable damage to both men, but I've never seen a better match of this type. Steve Austin's guest commentary added some humor, and he eventually slammed the cage door on Benoit's head, allowing Angle to escape. Just a violently athletic spectacle. This may be the best tag team match I've ever seen. When the World Tag Titles became RAW-exclusive during the 2002 brand split, Smackdown GM Stephanie McMahon created the WWE Tag Titles for her show and staged a tournament. The final two teams were Angle/Benoit and Edge/Mysterio, and their match at No Mercy destroyed every other match of 2002. These four men put on an astounding display of tag team wrestling full of false finishes, reversals, and amazingly crisp action. Angle and Benoit became the first WWE Tag Champions but would drop the belts to Edge & Mysterio only two weeks later. WrestleMania 21 was all about building the next class of WWE headliners, as Dave Batista and John Cena were positioned to shine. But for diehard wrestling fans like me the main event of this PPV was the interbrand challenge between Shawn Michaels and Kurt Angle. Despite never having wrestled each other before, these two put on a breathtaking 25-minute classic that ranks high on the all-time 'Mania list. Shawn played the charismatic daredevil as usual, while Angle was the grizzled mat technician. In dramatic fashion Angle forced a rare Shawn Michaels tapout with the anklelock, kicking off easily the best WWE feud of 2005. Almost certainly the best feud of 2003 climaxed on the September 18, 2003 episode of Smackdown in a 60-minute WWE Championship Iron Man match. The merciless Lesnar employed an unorthodox strategy early in the match, bashing Angle with a steel chair and sacrificing a fall by disqualification, in order to gain a long-term advantage. Lesnar would dominate much of the match and pull ahead 5 falls to 2. Angle spent the suspenseful third act of the match trying to catch up only to fall just short, losing the bout and the WWE Title 5-4. To this day I consider this not only Lesnar's best-ever match, but the best Iron Man match of all time. The ruthless bully vs. valiant athlete story was magnificently told and resulted in a match full of both action and drama. This is wrestling, my friends. Simply put, one of the wildest matches I've ever seen. At King of the Ring 2001, the Olympic Wrestling Champion and Vince McMahon's Son tore the roof off the Continental Airlines Arena in the most unexpectedly awesome garbage match in the history of the business. While the overarching storyline was the beginning of the most disappointing angle of all time, these two delivered an amazing, startlingly violent spectacle that on more than one occasion actually made me fear for Shane's life. Angle dominated early with his wrestling acumen, but Shane's fearless scrappiness kept him in the match. Then the action spilled out of the ring and into the entranceway, where Kurt Angle nearly murdered his boss's kid. Angle attempted an overhead belly-to-belly suplex through the glass staging area, but there was a problem - the glass didn't break. And Shane landed on his head. So Angle did it again, this time successfully, and with sickening results. They continued fighting behind the glass, where Angle attempted the same move and once again the glass didn't cooperate. So Angle simply rammed Shane through headfirst, resulting in the striking image of a bloodied Shane exploding through an opaque plane of glass. And that wasn't even the end! After 26 minutes Angle set a piece of plywood atop the turnbuckles and Olympic Slammed Shane to the mat for the three-count. This was the best match on the best-ever KOTR PPV, and in my opinion the best match of 2001. 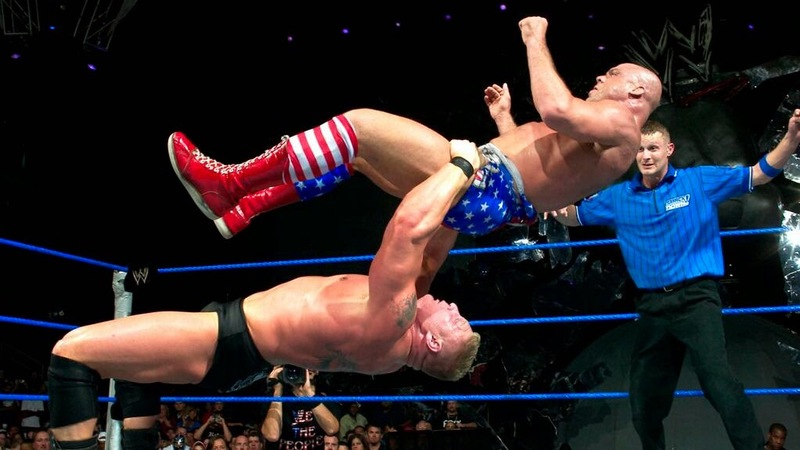 The 2003 Rumble was all about elevating Brock Lesnar, but on the undercard WWE Champion Kurt Angle defended against Chris Benoit in a near-perfect match. This was 19 minutes of pure excellence as the two ring generals started out slow and built to a fever pitch, showcasing their mat wrestling expertise and ingenious submission reversals. Angle finally got the win with a modified Ankle Lock, but the Boston crowd was so blown away by this match they gave Benoit a standing ovation. At the time Benoit was my favorite wrestler and so this was an amazing moment to be a part of. Obviously the events of June 2007 have tainted this memory, but this is still the best match I've ever witnessed live. Join us on Facebook, Twitter, MeWe and YouTube!